I've always liked the general issue postage stamps and revenue stamps of the Transcaucasian Federation. It's relatively easy and inexpensive to build a specialised collection and there is no major Forgery problem to deal with. But one challenge is to find the stamps and revenue stamps used in Armenia - they constitute only a small percentage of the total available material. 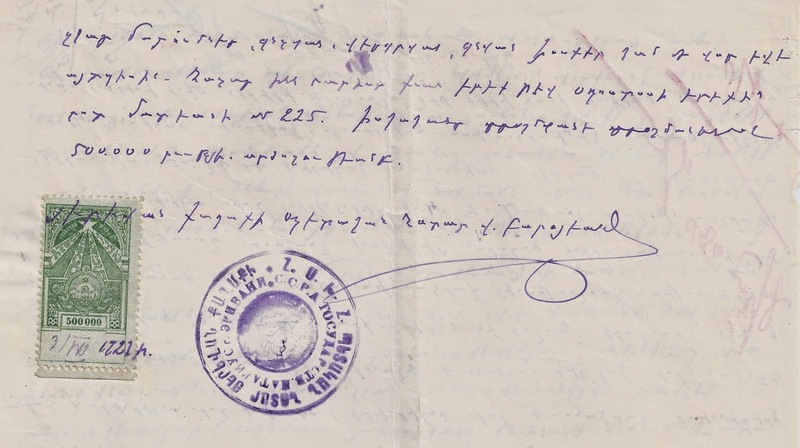 Below are images of parts of two Revenue documents originating in Yerevan. I liked these when I saw them. They are neat, they are simple and they are entirely credible. Both documents are the work of the same clerk, a person with neat handwriting and a consistent style. He or she has the habit of writing across the fiscal stamp, thus tying it to the document, a bonus for the collector. The first 1923 document uses an unoverprinted Federation general revenue stamp, the top value 500 000. Then in 1924 (February) , the clerk is using the new currency overprinted version [Zakiyan # 8] which revalues the stamp to 1 rouble 25 kopecks in "Chervonets" [ gold currency] roubles. It's interesting that the Currency change has - in effect - left unchanged what it takes to frank the kind of documents this clerk was working on. This is one reason why they make a nice pair for display.